Beginning the season in the B Division was not a prospect that would excite the Star's support. However, by the end of the season the supporters were basking in one of the Star's best seasons. With four teams being promoted from the B Division, the Star would be among the favourites to go up. A series of consistent results not only assured that the Star would be promoted, but also that the Thistle Cup would be secured as B Division winners. The Scottish Junior Cup was also to bring its share of excitement. 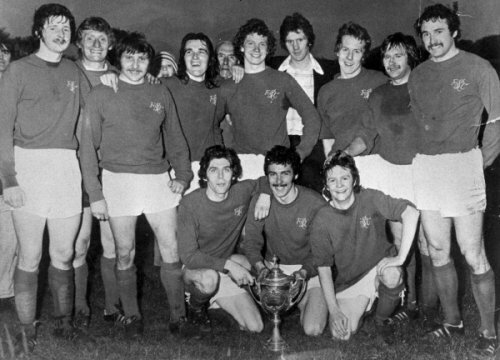 After accounting for Shotts Bon Accord in the first round, the Star ran into old adversaries Cambuslang Rangers, the dominant team of the 1970s and current holders of the Scottish Junior Cup. The Star had the benefit of home advantage and of the youthful talents of Alan Duthie who scored two goals to send the Star into the next round. Three games were required to get passed Tranent before good results were recorded against Bathgate Thistle and Troon in subsequent rounds. The quarter-final draw threw up a difficult trip to Ayrshire to face Kilbirnie Ladeside. The Star went down 2-0. There was further success though as the Star fought through to the Dryborough Cup final against Broxburn Athletic. 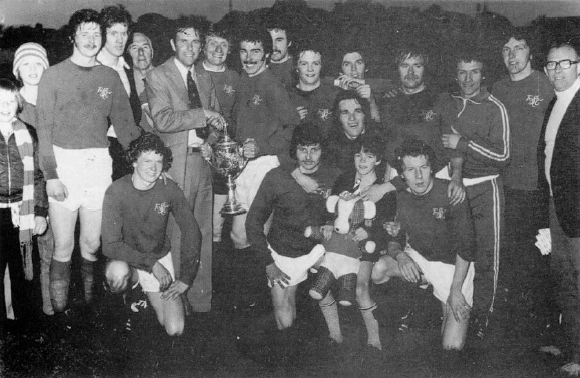 The first game ended in a draw, but in the replay, goals from Alan McLeod, Alan Duthie and Chris Robertson secured the cup. The sponsors Dryborough had also sponsored tournaments in the other Junior regions of Scotland. The winners of each cup would then be entered into the National Dryborough Cup. The Star were drawn at home to Arbroath Victoria in the quarter-final. A 4-0 win took the team through to a meeting with Glenrothes, a team that had won the Scottish Junior Cup only a few weeks before. The match was a tight affair and ended goalless. The method of separating the teams was a penalty shoot out, the first the Star had ever been involved in. Despite a lack of experience, both teams had little difficultly putting the ball in the net. Eventually though, the Star prevailed 10-9 to progress to the final against Glasgow side Petershill. The final took place in Cumbernauld before a crowd of 3000. Petershill were clear favourites, but the Star put in one of their best ever performances to record a resounding 3-0 win with goals from Chris Robertson, Alan Duthie and Iain Anderson. Haddington Athletic H 1 2 ? A 4 0 Cropley, ? Pumpherston Juniors H 2 1 ? A 2 1 Robertson, Britton Hogg, Liddle, Kelly, Carnegie, Cropley, Murphy, Anderson, Wood, Robertson, Duthie, Christie. Subs: Britton, Heavey. 1 A Shotts Bon Accord 4 0 Duthie 2, Anderson, ? N Tranent Juniors 2 1 Duthie, Cropley Hogg, Liddle, Russell, Carnegie, Cropley, Murphy, Wood, McLeod, Anderson, Duthie, Christie. Subs: Britton, Hogg. SF H Livingston United 2 1 McLeod, ? In the replayed final of the Dryborough East Region Junior Cup, the Star of Newtongrange landed the trophy at Olive Bank, Musselburgh by three goals to one goal over the Athletic of Broxburn. The West Lothianers were the first winners of the trophy, formerly the East of Scotland Junior Cup in 1897, and their only other success in the tournament was in 1951. The Star were out to land the cup for the sixth time having previously gained custody of the trophy in seasons 1907, 1926, 1930, 1958 and 1959, and in so doing gaining a place in the National Dryborough Cup. Within ten minutes the Star were two goals up, the two Alans, McLeod and Duthie netting. After the break Chris Robertson added a third goal. In the closing quarter right half Carruthers of Broxburn was sent off. In the dying minutes Reynold reduced his side's leeway. NEWTONGRANGE STAR completed their best season since they won the Scottish Junior Cup in 1929-30 by winning the Whitbread East Region Junior ‘B’ Division championship and gaining promotion to Division ‘A’ after having been relegated last season on goal average. And on Saturday at Cumbernauld they gained custody of the coveted Dryborough Cup and top prize of £300 in the sponsored tournament by a convincing victory over the favourites, Petershill, last season’s beaten finalists by Lochgelly Albert in the same competition. It was a gala occasion, a pre-match programme comprising a women’s five-a-side football game between Cumbernauld and Marathon Clyde Ladies clubs, a schools –penalty kick competition and a display by dogs of the Strathclyde Police giving the close on 3000 spectators an enjoyable entertainment. The Star opened strongly and within four minutes a bad defensive blunder by keeper Cassell allowed Chris Robertson, Star’s provisionally signed Rangers player playing his final game before being called up by his new club, putting the Star ahead. Petershill hit back but made little impression on the strong Star defence. Before half-time Duthie, freed by Celtic with whom he was a provisional signing, increased the Star’s margin. After the break Petershill tried desperately to improve their position but could find no loophole in the well organised Star defence in which keeper Hogg and Cropley excelled. The issue was settled when Iain Anderson, the Star’s veteran right winger also playing his final game, notched a third Star goal for a great East victory. 1 H Bonnyrigg Rose 1 3 Robertson Hogg, Kelly, Russell, Christie, Cropley, Carnegie, McLeod, Wood, Duthie, Britton, Robertson. Subs: Liddle, Murphy. This tournament was played at the end of the season for the winners of the leagues in the Ayrshire, Central and East regions.